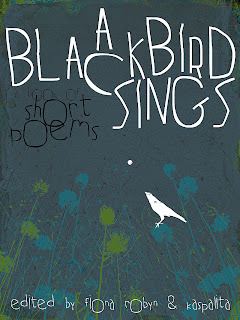 I’ve two haiku in A Blackbird Sings, a rather beautiful collection of “small stones” edited by Fiona Robyn and Kaspalita Thompson.”Small stones” are shortform observational poetry – that is, they take the intention of haiku into many other forms of tiny verse. It’s a lovely and unusual book and I’m delighted to be in it. Buy the kindle edition now, or preorder the paperback, and read about the project here.